Located in section 4 SW of Lincoln township. On C60 one half mile west of the K49 intersection. Underlined links lead to the corresponding obituary. **Family Note: "A Wetrosky cousin said this little cemetery also includes the grave of a man who worked with explosives & he blew himself up. He was a shirtale relation. This cousin also said that ggrandpa Wetrovsky was not a church going man & the Lutheran church would not allow him to be buried in their cemetery so the Mathwigs gave the family a 60 X 60 ft. plot for family burials. One of the Wetrovsky daughters was married to a Mathwig." --OBSERVATION: One of the family researchers has commented that very likely Gottlieb's first wife Minnie may have died in the old country. His second wife is known to be: Augusta A. Schroder (born 1857 and died 1944.) Augusta is buried in Trinity Lutheran Church Cemetery. --Another Observation: Apparently the Mathwig family already had family members buried in this plot at the time of John Wetrovsky's death in 1913. There is a stone marking the graves of Gottlieb & Minnie Mathwig in this cemetery, however there are no dates on their joint tombstone. 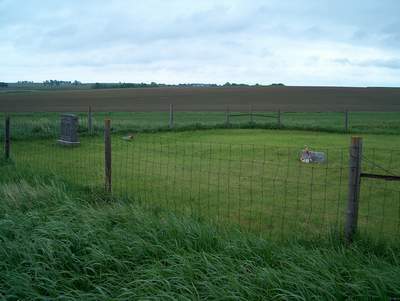 It is likely the Mathwig stone was placed later by caring descendants.